We all know hamsters need water to survive, but you might be wondering, just how much water do hamsters need? Don’t worry, we did our research, double (and triple) checked the answer, and we have you covered! Hamsters need to drink about two teaspoons (or 10ml) per 100 grams of their body weight each day. Most hamsters weigh roughly 200 grams; therefore, this means your hamster should consume 20 ml or 4 teaspoons of water daily. There are some variances, such as the weight or breed of your hamster but all hamsters need daily access to fresh, clean water. In this article, we’re going to tell you how much water your hamster should consume, how to know if your hamster isn’t drinking enough water, and guide you through some of the best hamster water bottles available! How much water on average does a hamster need? It may not seem like a lot to us, but hamsters need to drink an average of 10 to 30 ml of water every day, that’s roughly 10ml per 100gram of your hamster’s body weight. As per the Nutrient Requirements of Laboratory Animals (4th edition), the amount of water a hamster consumes varies depending on the gender and breed. Here is a listing of specifications, per 100g of body weight per hamster daily. While most hamsters weigh around 200 grams, this is not the case for all breeds. The average Syrian hamster weighs 140-200 grams, however, the Dwarf hamster weights roughly 50 grams. Based on this information, Dwarf hamsters require less water than a Syrian hamster would require. While you might notice a Syrian hamster consume 20ml of water daily, a Dwarf hamster might drink around 5ml of water per day. Why do hamsters need a water bottle? Hamsters need a water bottle because they require consistent, reliable access to water and a water bottle can provide that easily. While you should check your hamster’s water daily if you do happen to forget a day a properly functioning water bottle will not dispense water unless your hamster drinks it. If you’re unsure if your hamster is drinking enough water you can fill your hamster’s water bottle with water and, using a dry erase marker, make a line at the highest point. Check your hamster’s water bottle periodically to see if the water is going down. You should be able to determine whether the water bottle is leaking by touching the bedding just below the water bottle, if it is wet or quite damp, you may have a leaky water bottle on your hands and need to repair it or purchase a new one. If you’re still wondering if they’re drinking water or having trouble accessing water from their water bottle, keep an eye on them. You’ll notice that after playtime, such as spending time in their exercise ball, your hamster will be ready for a big drink of water. Can a hamster drink tap water? 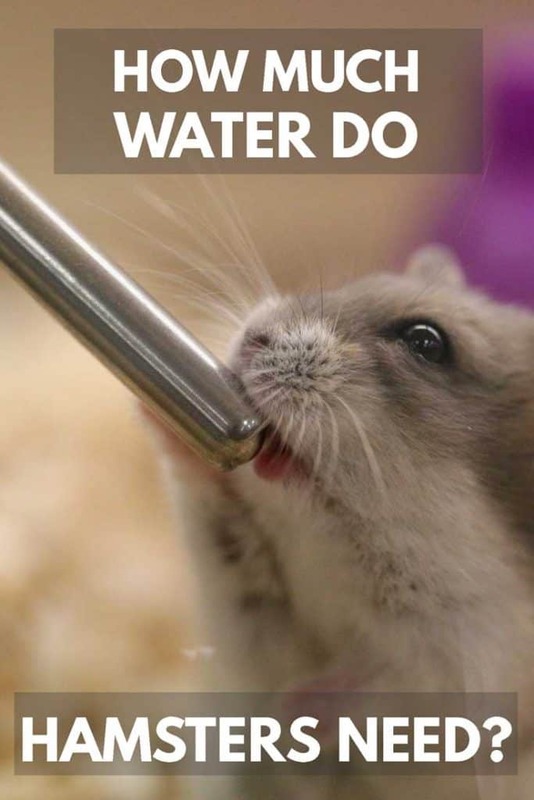 Hamsters can drink tap water as long as it’s drinkable and isn’t contaminated or polluted. Make sure the water you give your hamster isn’t too warm or too cold, room temperature is best. We recommend giving your hamster bottled or distilled water. Distilled water that is obtained from the vapor of water boiled to remove impurities and what remains in the original container is the impure water. The water that is obtained from the vapor is distilled. Do hamsters enjoy swimming in water? Hamsters are not natural swimmers. They generally hail from dry climates and do not have a preference or natural inclination towards the water. 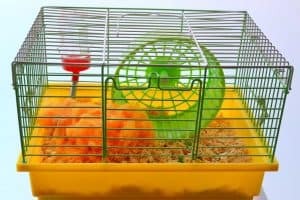 If you place a water dish in your hamster’s habitat, they will not choose to play in their water dish but may accidentally get wet while playing in their cage. We suggest water bottles as opposed to water bowls because your hamster could unintentionally get wet and can quickly catch a cold. A cold might not seem like much to us humans, but they can become very harmful to a hamster. Can a hamster drink water from a bowl? Hamsters can drink from a bowl, but it’s best to provide your hamster with a water bottle. A hamster will knock over a water dish, spilling the water in their cage and making a mess. Or they might accidentally spill nesting materials in the bowl which can contaminate the water. Some hamsters may prefer a water bowl over a water bottle. If your hamster prefers a water bottle, it is best to place the dish higher up and changing their water daily is very important. One way to tell if your hamster is dehydrated is carefully and gently pinch the loose skin at the scruff of their neck. In a properly hydrated hamster, the skin should quickly fall back into place. If your hamster is dehydrated, the skin will slowly fall back to its original position. If you believe your hamster is dehydrated, you need to seek veterinary care for your pet right away. If it has been a couple of hours your hamster was without water, you can provide your hamster with water and they’ll likely jump at the chance to rehydrate, and they should be okay. If your hamster has been without water for more than a few hours, your veterinarian can provide an IV for your hamster to help remedy the problem quickly. When purchasing a water bottle for your hamster, you’ll want to consider a few things before running out to buy one. Here are a few things to keep in mind when purchasing a water bottle for your hamster’s cage. Water bottles come in a variety of sizes, that is because some are intended for a variety of animals! A water bottle with a larger opening for feeding or one that holds a lot of water might be for larger dogs. If the water bottle is too big an excessive amount of water might come out at once which might be upsetting to your hamster. If you have more than one hamster, you will need more than one water bottle for your hamsters. It’s best to have at a few, should they feel territorial and not want to share. Also, place the water bottles in different places around the cage. Water bottles can be installed on the side of a cage or as part of a freestanding structure. 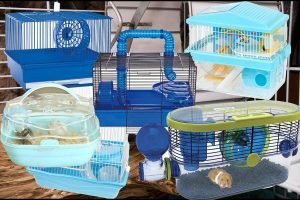 Depending on the size of your cage and how much space is available, you may choose a mounted water bottle for your pet hamster. Both options work well; you’ll need to pick one that suits yours and your hamster’s needs. The ideal placement for a water bottle should be out of direct sunlight but in a spot where you’ll see it daily and notice the water is running low. After you rinse the water bottle with hot water, fill it with cold water all the way to the top to ensure a vacuum is created inside, and no water can leak out. Test the water bottle before giving it to your hamster to ensure they can easily access the water. You can do this by locating the ball bearing and pushing it upwards. Which water bottle should you buy for your hamster? There are many options available when it comes to water bottles for your hamster and we know it can be overwhelming trying to figure out which one to choose. We did our research to find out which water bottles come highly recommended and will please both you and your pet. Hamster owners love this no-drip water bottle. It holds 11.2 oz of water and is leak and drip proof. People like that it’s easy to install and that the water bottle snaps on and off quickly for cleaning and refilling. This water bottle has the option of hanging inside or outside of the great, which makes it easily adaptable. The glass bottle holds 12 ounces of water and easy to refill. Pet owners like that the Living Word water bottle is durable and easy to clean. This 32oz water bottle is perfect for enclosures with multiple hamsters, or one very thirsty hamster! Pet owners low that it is low-cost, and doesn’t drip. Your hamster will enjoy using this sturdy structure for hydration and play! While this water bottle only holds 75ml of water, it’s affordable enough to place a two (or more) around your hamster’s cage. This water bottle and hut are the perfect sizes for a dwarf hamster, holds 80ml of water, and pet owners love that it doesn’t leak. Perfect for hamsters of all shapes and sizes, this structure holds a water bottle and a food container dish all in one. Pet owners like how convenient it is to have both together necessities combined. This water bottle and food container base are sturdy, and reviewers note that it does not tip over. There are variables to how much water a hamster will require, of course. Being aware of each hamster’s needs is essential. For instance, if the climate is slightly warm, or if your hamster is pregnant or recently gave birth to hamster pups they might need to drink more water. By making sure fresh water is available for your hamster you’re in turn helping them live a longer, healthier, and hydrated life. Previous PostWhat Kind of Hamster Do I Have? 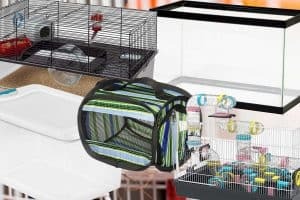 Next PostWhere Should I Put My Hamster’s Cage?